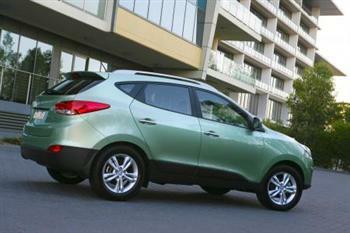 All-new ix35 takes Hyundai into the heart of the growing compact SUV segment. A powerful stance with sophisticated surfaces. Inspired by the concept of an urban nomad, new ix35 is a sleek crossover with athletic proportions, featuring advanced weight-saving technology, eco-efficient powertrains, class-leading safety equipment, and outstanding value for money. Designed at Hyundai's Design Centre Europe at Russelsheim in Germany, new ix35 symbolises the evolution of the brand's exterior and interior design, through the introduction of 'Fluidic Sculpture', an architectural language which will be embodied in future models from Hyundai Motor Company. 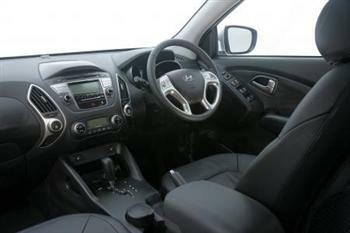 The new ix35 is available in three trim levels, Active, Elite and top of the range Highlander. With a wide choice of engines and transmissions plus a range of premium features including rear camera, panorama glass roof and full iPod® integration, new ix35 brings 'designer' style and luxury to the compact SUV segment. Starting with a clean slate, Hyundai's development team moved away from the two-box off-roader look in favour of a sleeker, more refined profile while simultaneously achieving a roomier cabin, extra storage capacity and excellent fuel economy. 'Fluidic Sculpture' symbolises the flow of water. Clearly contoured surfaces are delineated by defined, naturally graduating lines. A subtle yet powerful double 'Z' form emerges from the body. The concave sills have a wedge-shaped profile extending rearward, wrapping around into the rear bumper. Developed as an urban cruiser, ix35 is compact and agile for life in the city, yet tough and versatile for out-of-town travel. The hexagonal grille previewed on the 'ix-onic' concept car moves into mass production on the ix35, a defining look which will serve to unify the family of future Hyundai products. The grille is body colour on the entry level Active model and finished with chrome highlights and complimented by chrome door handles on Elite and Highlander models. Swept back headlights, a lower air intake and heavily inclined A-pillar add to the sporting appearance, whilst prominent wheel arches impart a confident stance. The rear quarter glass, swooping rear lamps, oversized bumper and sloping tailgate enhance the sporting look. The integrated rear spoiler further reduces fuel consumption. All model variants are easily identified by their wheel designs – 17 inch alloy on Elite and 18 inch on Highlander – adding to the range's individuality. Inside ix35's cabin, a definitive 'X' zone characterises the centre fascia with black and metallic finishes throughout the interior. On ix35 Elite and Highlander models, convenience and practicality are enhanced with the implementation of the push button start function and proximity smart key allowing the car to be opened at the touch of a button located on the front doors and tailgate. On all model variants, the four spoke steering wheel incorporates controls for management of audio and cruise control systems. All instruments and gauges are backlit in Hyundai's signature blue colour. Acceleration is via a modern organ-type pedal designed to offer high levels of comfort and sensitivity, by allowing the entire foot to rest on the surface of the pedal at all times and under all rates of acceleration. Active and Elite models come with air conditioning, whilst Highlander models are equipped with dual-zone climate control featuring a cluster ionizer that improves air quality in the cabin. The Highlander's panoramic glass roof maximises light ingress and adds to the sense of spaciousness. An adjustable roll blind can be fixed to ensure 100 per cent light block whenever necessary. The front glass opens electrically, while rear passengers can enjoy panoramic vision through the fixed glass overhead. Across the range, the driver's seat offers six-way electric adjustment plus electric lumbar support, allowing taller drivers to find a comfortable driving position. Added seating conveniences include second row armrest with dual cup holders and multiple seating layout configurations. Active models feature high quality cloth upholstery, Elite models are finished in a combination of leather and cloth and the top of the range Highlander features all-leather seating. Inclusions such as a standard luggage screen cover provide privacy and security for valuables in the cargo area, while a luggage net (standard on Elite and Highlander models), secures loose items. There are three engine variants across the model line-up. ix35 Active - 2.0-litre petrol 2WD (five-speed manual and six-speed auto), ix35 Elite - 2.4-litre petrol AWD (six-speed auto), ix35 Elite - 2.0-litre R-series turbo-Diesel AWD (six-speed auto) and ix35 Highlander - 2.0-litre R-series turbo-Diesel AWD (six-speed auto). A full-time electronic AWD system automatically controls power distribution in ix35 AWD model variants. The AWD ECU detects varying road surface conditions and driving inputs, distributing optimum driving force between the front and rear wheels. The six-speed auto uses a step gate pattern to eliminate miss shifting, while leather shift knob improves look and feel on Elite and Highlander trims. Like the i30, i30cw, Santa Fe R-series and iLoad, the suspension of ix35, has been developed and optimised for Australia's unique road conditions. The ix35's front suspension has a 25 mm hollow stabiliser bar to save weight. The rear suspension has an 18 mm solid stabiliser bar. Active aerodynamics are realised through intelligent windshield design, integrated rear spoiler, engine undercover and wheel deflectors. Hyundai engineers have taken the 'World Engine', the largest petrol engine programme in the world, and provided the lighter, more fuel efficient and cleaner-running Theta-II. ix35 Active models features the 2.0-litre Theta-II which has shed over 10 kg from its previous iteration. For better fuel efficiency and reduced NOx emissions, the 2.0-litre Theta-II comes with Dual CVVT (exhaust camshaft phasers)and a two-stage Variable Intake System (VIS) which enables switching between long and short intake manifold resulting in an across-the-board performance increase. To reduce internal friction, engineers applied a Diamond-like-coating (DLC) to the top surface of the valve tappets resulting in improved fuel efficiency. Engineers also expended considerable time and effort optimising the oil pump pressure to achieve an ideal balance between durability and fuel economy. ix35 Elite models are available with the Theta II 2.4-litre DOHC inline four-cylinder engine. The 2.4 Theta II engine delivers about the same amount of power and acceleration as its predecessor's V6 engine with 16 per cent better fuel economy than the old four-cylinder engine. Developed by a team of 150 engineers at an investment cost of AUD$227 million, the all-new 2.0 litre R-series turbo-Diesel engine is the latest generation of Hyundai's famously fuel-efficient range of diesels, seen most recently in the new Santa Fe 'R-series'. Available in either Elite or Highlander models, the 2.0-litre R-series engine is matched with the six speed automatic, producing 135 kW of peak power and 392 Nm of torque, providing enough 'grunt' to tackle any task. The 'R-series' engine benefits from the third generation of Bosch's common rail system, whose piezo-electronic injectors deliver fuel at 1,800 bar with an unprecedented degree of accuracy and control. It also features an electronically controlled variable-geometry turbocharger and is managed by an advanced electronic control unit. With a 16-valve dual overhead camshaft driven by an internal steel timing chain, the R-series engine is also fitted with a highly efficient exhaust gas recirculation system with by-pass valve and a Diesel particulate filter. CO2 emissions are a respectable (for an SUV) 198 g/km. NVH is reduced by a lower balance shaft encased in a stiffened crankcase housing for increased rigidity. Weight-saving features include a serpentine belt with isolation pulley, and the use of plastics in the head cover, intake manifold and oil filter housing. Computational fluid dynamics, structural and thermal analysis were used to optimise the design, while computerised simulation of the die-casting process was used to achieve the optimum balance of both strength and low weight. Over 500 prototype R-series engines were built during the 42 month development period and subjected to a wide variety of performance and emission tests, endurance assessments, and NVH, cooling and lubrication studies. Finally the engine was installed in vehicles for exhaustive real world testing under all imaginable climatic conditions. The ix35 comes with the option of Hyundai's tried and tested five-speed manual (Active models only) or the new six-speed automatic with electronic sequential manual mode (all model variants). 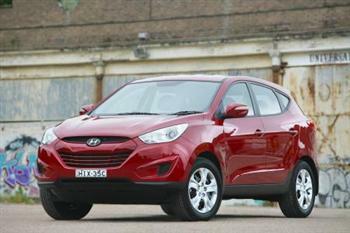 Designed for transverse engine applications in passenger cars and SUVs, the new compact transaxle places Hyundai in an elite class of automotive manufacturers who have designed their own proprietary six-speed auto (after Toyota and a GM/Ford joint venture), demonstrating Hyundai's power train engineering capabilities. The strength of the design is its unique layout which makes it more compact and lighter than any other six-speed currently available. The gearbox has three planetary gear sets and a compact torque converter and four pinion differentials improve durability and further minimise overall size. Because there are always slight manufacturing deviations from one solenoid valve to the next, causing fluctuations in hydraulic pressure that in turn affect shift precision and quality, the transaxle features cleverly calibrated adjustment screws that enable each of the eight valves in the hydraulic pressure control unit to be set at the factory. This feature ensures stable hydraulic pressure at any shift point, delivering fast, smooth and precise shifts throughout the rev range. The unit is maintenance-free, filled with an automatic transmission fluid good for the life of the vehicle (hence there is no dipstick), reducing maintenance costs. The ix35 comes standard with a trip computer providing distance to empty, average fuel consumption, average vehicle speed, elapsed time and instant fuel economy. Note: ^Australian Design Rules 81/02 static laboratory combined average city and highway cycle test. Fuel consumption will vary depending in a combination of driving habits and the condition of the vehicle. 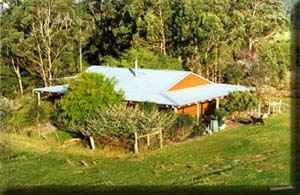 The eco-adventurer Hans Tholstrup drove an ix35 Highlander 2.0-litre R-series turbo-Diesel AWD from Melbourne to Adelaide and back to Melbourne on a single tank of fuel, covering 1,446 km, consuming only 70.23 litres of Diesel. This translates to 4.85 L/100 km or over 58 mpg. The ix35 comes complete with a comprehensive suite of advanced safety features to ensure driver and passenger confidence. Standard on all models is ABS (anti-skid braking system) EBD (electronic brake force distribution) and ESC Stability Control incorporating TCS (traction control system). The braking system features four-wheel disc brakes controlled by an advanced four-channel ABS with Brake Assist, providing maximum braking force when a panic stop is detected, and Electronic Brake-force Distribution (EBD) to optimise brake performance with uneven weight distribution. ESC Stability Control compares the driver's intended course with the vehicle's actual response. This hi-tech system assists driving safety by actively controlling engine torque and braking. It senses wheel speed, vehicle turning manner, angle of steering wheel and driver pedal input and if needed, ESC Stability Control then brakes individual front or rear wheels and/or reduces engine power to help correct understeer or oversteer in a critical situation. The ix35 introduces two new safety features - Hill-start Assist Control (HAC) and Downhill Brake Control (DBC) - which promote safer travel up and down steep slopes. HAC is designed to minimise rolling backwards on steep ascents by maintaining brake pressure for a couple of seconds after the driver releases the brake. By selecting the DBC switch, the Hydro-Electronic Control unit manages the wheel speed sensors, steering angle sensor and acceleration sensor to maintain control and speed on steep declines without the driver having to operate the brake pedal. In Elite and Highlander models, an advanced electronic AWD system designed by JTEKT automatically activates under any driving condition when needed, distributing the power equally and optimising driving performance. Under normal driving, the system only distributes power to the front wheels thereby reducing fuel consumption. The system includes a driver-selectable AWD lock allowing for a 50/50 torque split between the front and rear wheels for off-road and very slippery conditions. For safer manoeuvring in reverse gear, a rear-view camera is standard on Highlander models. Selecting reverse gear automatically turns on the rear-view camera which provides a wide-angle view of the area behind the car on an 8.5 cm colour LCD built into the rear-view mirror. A Smart Parking Assist System uses the rear-view camera to provide a graphical grid overlay to guide the driver safely into the parking space. The rear-view mirror is also electro-chromic, automatically dimming during night-time driving to reduce the glare of the headlights from vehicles behind. The entire body shell makes extensive use of ultra-high tensile strength steel which comprises 68.9 per cent of the shell. Tailor Welded Blanks (TWB's) have been expanded on key structural members reducing body weight, while enhancing crash energy management. Elongated flush-mounted headlamps feature projector beam lenses for improved night-time driving safety, while side mirror housings have been modified to reduce wind noise and also feature an integrated repeater lamp for improved visibility. At the flick of a switch, foldable mirror housings on ix35 Highlander models fold inwards to reduce the overall width of the vehicle – ideal for inner city parking. Three-point seatbelts are provided at all five seating positions, while front row seat belts have pretensioners and load limiters. There are three child seat mounting points. 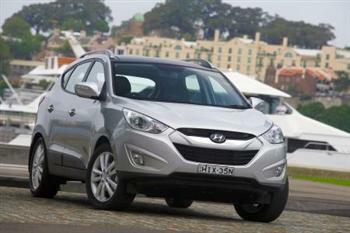 A total of six airbags are positioned in the Hyundai ix35's interior. Dual advanced frontal airbags are complemented by front seat-mounted side-impact airbags and roof mounted side curtain airbags. The combination of side and curtain airbags help protect the head and body during side impacts. All four doors have internal guard beams to protect passengers in a side-impact collision. Designed to specifically enhance the ix35 experience and keep customers connected, entertained, protected and portable, a wide range of Genuine Hyundai Accessories are available. Whether its bike riding, paddling, skiing, snowboarding or just travelling, the Genuine Hyundai Whispbar™ Quiet roof racks ensure sporting demands are met with ease. In-car entertainment is enhanced with iPod® accessories including Direct Connect for iPod® enabling playback from an iPod® library directly through the vehicle's audio system. The Genuine Hyundai DVD entertainment system ensures travel in the ix35 is even more fun with integrated Nintendo® and Sony Playstation® compatibility. Providing a complete range of services designed to provide roadside support, the Hyundai Premium Assist programme offers a range of services tailored to promptly assist in the event of unforeseen circumstances. Note: **Conditions apply, see Hyundai Premium Assist programme for details. Hyundai offers customers an outstanding Five Year/Unlimited Kilometre Warranty. Hyundai's priority on quality has resulted in recognition globally for outstanding excellence and reliability. Note: † Manufacturer's List Price (MLP) - includes G.S.T, but excludes dealer deliver and statutory charges.